I was going to go into great detail on the escapades of the Relay for Life that I participated in, but I doubt you want to hear to whole long, drawn out story. I’ll try to trim it down into something readable. The Weather ~ well, it wasn’t too bad when Katie and I arrived at around 3:30 p.m., but we heard a storm was on the way and, sure enough, within about 20 minutes the sky was dark and truly scary. We quickly popped up our tent (but did NOT secure it, duh! ), and went to set up the pop up tent for the vendor booth. We had just gotten the top up and were beginning to secure it when the wind hit and hit H-A-R-D! I was holding one of the legs on the back side of the tent and when the wind blew, it lifted me almost off the ground! Katie had the front and was trying to stake them down, and (Praise the Lord) a kind young man in the vending booth next to us grabbed the other back side leg before we all went toppling over. For a few minutes, we all three just held on for dear life until the wind finally subsided – about 10 minutes. We did have just a little bit of rain at the beginning of the Team Banner walk, but it subsided too and everything quieted down. Our bake sale went very nicely. I wasn’t too sure we’d have enough in baked goods, but my friends came through like gangbusters and we had cookies, brownies, s’mores, cupcakes, scones and a myriad of great things that sold well! It was a lot of fun chatting with some of the people who stopped to look and/or to buy. We met some interesting people. We even had a “vegan” stop by looking to see what we had to satisfy her cravings ~ we provided a trail mix combination that she loved and came back for more! All total, we earned a little over $100 from just the bake sale/vendor booth. The Atmosphere ~ Wow! what can I say about the whole thing? It was organized chaos! So much fun! There were so many things going on throughout the entire night that you couldn’t NOT have something to do! There were themed laps that were sponsored by teams. Things like a hula hoop lap, crazy hat lap and the like. There were bands and entertainment on the stage all the time. Kids were dancing and having an awesome time. There was a quieter time when they read poems and reflected on the reason we were participating in this event. There was the luminaries lit up around the track and up in the stands after dark. It was truly beautiful and inspiring. We were not the only team to have a vendor booth, the whole trackside was lined with other teams and some companies that had wares to sell. How about glow-in-the-dark cotton candy? There was even one young girl walking around with a sign that said she was selling hugs for $1.00 each! Lol! There were crafts and food everywhere. For awhile, I went up to our campsite (around 1:00 a.m.) just to see if I could lay down and rest for an hour. Each campsite was very small… just large enough for one or two tents, one in front of the other, and then a couple of chairs and most other campsites had fire pits with warming campfires lighting up the night. We did not have one of those. So our tent was pretty cold, made worse by laying on the ground (on top of sleeping bags) and even with a heavy blanket, resting was futile. Especially since all the other campsites were rowdy and having fun etc. After an hour, I gave up and went back to the vending booth and kept Katie company again. Did I mention that the theme of the night was “Mardi Gras”? 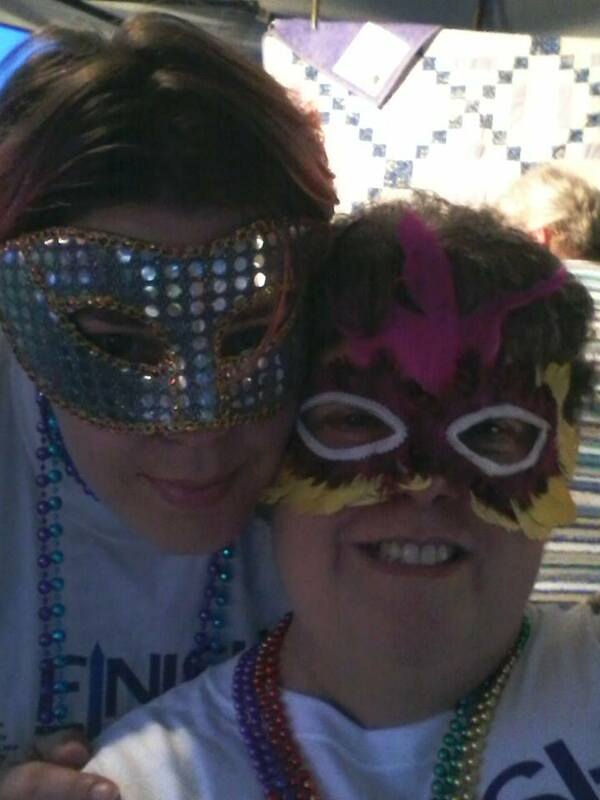 There were beads everywhere, but I can honestly say we were the only two with masks. Our bake sale customers apparently loved it as we got lots of compliments and smiles. Things began to die down around 3:30 a.m., so we decided to pack in the bake sale booth and stay at camp until 5:00 when Al was supposed to show up and help us pack up to go home. It seemed like around 4 a.m. all of the other campers and vendors were packing it in and heading out. So I called Al and (after waking him up) asked him to come now as we were pretty much done. In the wait time for Al to get there, we tore down our part of the campsite and put our things away and loaded up my SUV with as much as possible. When I say “we” I really mean Katie… as she did the bulk of all of the hauling, lifting, pushing, pulling and everything else related to both the campsite and the vending booth! She never once complained or skipped a beat in doing whatever was necessary to get the job done. Not once. Indeed, if it weren’t for Katie’s help, none of this would’ve even been pulled off. With my mobility becoming more of an issue, she just stepped right up and lent a hand everywhere! The Quilt Raffle ~ Al made me an awesome quilt rack (that I didn’t even know about), and he brought it to the vendor booth and set it up so I could display the raffle quilt and sell more raffle tickets prior to the midnight drawing. At midnight, the American Cancer Society Coordinator, Sarah Curtin, came to our vending booth to pick the raffle winner. She chose the ticket and read me the name, then went to the stage to make the official announcement on the loudspeaker. Heather VanLuven Skiff was the winner! Heather owns a salon in Weedsport, and has been mine and Al’s hairdresser for the past 15+ years. All in all, the raffle brought in $415.00. I was the second highest earner on our team (the highest earner works at a doctor’s office with access to many physicians etc). Our team total was $1,859.20 ~ our goal had been $1,000. Not too shabby! Reflections ~ Would I do this again? I would LOVE to, but it’s too much hard work involved and I’m not able to do as much/enough anymore. I am becoming too dependent on my husband and my daughter to do all the grunt work, and it’s not fair to them. It’s definitely a FUN event, and I would recommend it to anyone and everyone who is very active, can stay up all night, likes to camp, and doesn’t mind hard work. I thought early on that I’d like to have my own team next year, and I would love to, but I’m not sure I can go through this again… at least not like this year. We’ll see. I don’t HAVE to have a vending booth. I could just go as a spectator – anyone can come, there’s no admission fee. Just come and browse the vendors, enjoy the entertainment and support the American Cancer Society. It’s too soon to plan that far ahead. Thanks for stopping by and taking a peek at how the Relay went. See you next time. Okay, now that I’ve got the title of my newest post down, I scarcely know where to start from here. The past 24 hours have been … “interesting”, to say the least. I’m still running amok with a multitude of emotions, convictions and prayers. At this very moment, I’m determined. But in ten minutes, I may be a fearful bag of tears. Trying NOT to go there! I think I’ve had my wake up call. Like the drop-dead one of them all ~ besides ever being told that I’m terminal. But I already know that. Yesterday I heard the words “you are riddled with” from an orthopedic specialist of an orthopedic group that I highly respect and trust. I barely heard him say “osteoarthritis in your right foot.” I had gone there by requested referral from my primary care doc to determine what had been the cause of incredible pain in my right foot for about the past year. I’ve been putting it off, thinking it’s only tendonitis and it would go away eventually. Instead, the pain has increased, and I have become accustomed to ignoring it and hiding it (like I do my chronic back pain) until most recently when I realized it’s just too painful to ignore. My ability to walk distances has become extremely compromised, making even grocery shopping difficult at best. Any mall is an absolute nightmare, and I’ve given up on ever seeing the inside of one again. The maximum allowable time limit for me to be able to walk currently is about 15 minutes before my foot “gives out”. After an hour or two of rest off my foot, I can continue again, for about another 15 minutes… maybe. But, yeah, OA (osteoarthritis) ~ wasn’t expecting THAT one! Since yesterday, my thoughts have been racing. The ortho doc said low impact aerobics, swimming, and ortho shoes/sneakers. Ugggh! Seriously? I’m going to have to change my whole lifestyle for this affliction! Well, yes, I am! There is no cure, only pain management and exercise because weight loss will help. There it is again… that weight loss stuff! That ALWAYS just keeps popping up, doesn’t it? I had today off from work, and was planning on staying home and doing some sewing/quilting. However, I ended up researching gyms/health clubs locally online that also have a swimming pool ~ AND are relatively affordable. With that, I decided on the YMCA, their North Area location (North Syracuse/Liverpool/Cicero/Clay area), and I drove the 15 miles to take a tour and find out more. Their “open swim” times coincide pretty well with my schedule, but I will need and am willing to make massive changes, including getting up and out the door by 5:00 a.m. each weekday I go, taking everything work-related with me, including breakfast, swimming and working out and then making it to work (30 minutes from the Y) before 8:00 a.m. I have not yet joined, but will talk with the husband about it tonight. Wish he would join with me, but he is NOT willing to change HIS schedule for anyone or anything. Satisfied with the YMCA tour, I decided to go back to SOS (Syracuse Orthopedic Specialists) as they have a”store” where they sell orthopedic items (shoes, sneakers, socks, braces etc), and I wanted to take a second look at their shoes and sneakers, as I will obviously need to trash all my other non-supportive footwear and get used to buying “ugly” ortho shoes! The fact that I have small feet (size 7), and a high instep should make this interesting. But the SOS store had a wonderful customer service woman who was very attentive and knowledgeable. Of course, all of the shoes were those European sizes (36-37-38 etc), and were created obnoxiously narrow. After about an hour of trying on various shoes/sneakers, and actually meeting with their specialty orthotic shoe person on staff, we were able to come to consensus on a pair of shoes and a pair of sneakers… with added/padded insoles. I wasn’t going to purchase two pairs of anything, because it’s very pricey and made my stomach feel a little sick to see the price tags. But I needed to have something to wear to work, and something more casual. I mean, what woman can get by on ONE PAIR OF SHOES? Seriously! Especially since I knew when I got home I would be trashing all of my current shoes in my closet. No more even looking longingly at a pair of heels. Okay, so they aren’t “bad” shoes. 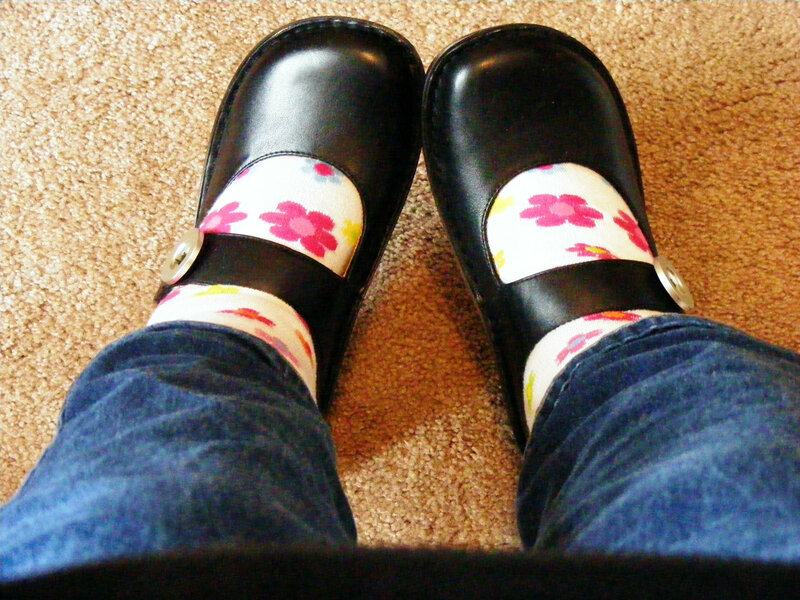 They kinda look like my MaryJanes I was wearing earlier, but have now tossed in the trash ($3.00 from WalMart). But these new shoes are very comfortable. I was informed it’ll take awhile to get used to them, that is believable. And they should last! After all, I could’ve flown from Syracuse to LA and back on the price of these two pairs. I think I heard my credit card (that I have not used in over a year) cry out in pain as I swiped the card reader at the store. I’ll add a sneaker photo later on. So, I guess I’m entering a new phase in my life that will affect my entire lifestyle, yet again. I’m back “on the wagon” with my better eating habits, after being on hiatus for a few months – off and on. I so want to make this work! The alternative is just unbearable for me. I will not be immobile. If I don’t lose the weight, that’s exactly where I’m headed – in short time! This is it. This is do or die. By the way, what about the Relay for Life in June, and the quilt raffle? Yeah, I’m still on board with that all the way. I don’t care what that takes, it’s ON. When I explained to my doc about the upcoming relay, he said there are a few “short term options” we can use to just get me through that event… since I’m “adamantly committed”, he said. So, please keep that in mind when you visit my other blog with the information about the quilt raffle etc. I haven’t gotten to my goal yet…https://tamaraeckstadt.wordpress.com/2014/03/16/quilting-to-crush-cancer/ Help give me some incentive by supporting my Relay. And I am adamantly committed! Do you know someone who currently has some type of cancer? Either themselves or a family member? Do you have a friend, acquaintance or know someone who has survived cancer of any kind? A friend of mine died last week from cancer, and, for some reason, this one death has brought the whole cancer fight to the forefront of my life. Suddenly. I have been affected by cancer in my family. I have a 14 yr old great-nephew who is a young survivor. My father had cancer (though he passed on due to other causes). Did you know that this month, March, is National Colon Cancer Awareness month? Have you ever had a colonoscopy? Ladies, do you check your breasts often and regularly? Me? Yes, yes and yes! I not only talk the talk, now I’m going to walk the walk! I will be walking to save lives on Friday & Saturday, June 13-14, 2014, at CW Baker High School (my alma mater) in Baldwinsville, New York. Why? Because I CAN and want to for those who cannot. Relay participants, including me, all participate because we’ve been affected by cancer in some way, and because a Relay For Life event gives us the power to fight back. This is my opportunity to honor cancer survivors, remember people we have lost, and help raise funds for the American Cancer Society. To help the ACS receive even more donations, I’m not simply asking my friends, family etc. to make a donation, but I’ve giving it a little more “interest”. I’m making a queen size quilt to raffle, and here’s your chance to not only make a difference by donating to the American Cancer Society, but you just might win a great quilt in the process! My Relay for Life Quilt is an approximate queen size quilt. The top and bottom are 100% cotton. The batting is a collaboration of cotton, bamboo and rayon… and is soft yet light. The colors of the top are navy blue print, lilac, and ecru & beige print. The backing is a “mottled” purple. This disassembled quilt has been kicking around in my closet for about 4 years, and I finally decided to pull it out and finish it just for this purpose. It is currently “in the works”. I am working on “sandwiching it” this weekend, and begin quilting next week and will hopefully have it bound by the end of this month. I will continue to update and post photos as I go along. Go to My Personal Relay Page and click on the “Donate Now” link, right there to the right of my photo. Do Not Donate Anonymously. You need to donate using your name so I will know to put your name on a raffle ticket! A $5.00 donation will get you one raffle ticket; a $20 donation will get you four and so on. Once you donate, I will receive an email notification that you have made a donation on My Personal Relay Page, and I’ll know to add your raffle ticket to all the others who have donated as well! ONLINE DONORS HAVE UNTIL MIDNIGHT JUNE 10, 2014, TO MAKE YOUR DONATION AND GET A RAFFLE TICKET IN YOUR NAME ADDED FOR A CHANCE TO WIN. When and how will you know that you’ve won? The quilt will accompany our Team, “The Pastor’s Flock“, to the event on June 13, 2014. There, it will be displayed and there will be an opportunity for others to buy raffle tickets for $5.00 each while at the event. Those who purchase raffle tickets at the event will have their names added to the online donors and all will be mixed up before a winner is chosen! One ticket will be drawn, and that person will win the quilt. If I know that person, I will notify him/her in the most expedient way (email/phone/text/Facebook/Wordpress blog)… OR there is a space on the online donation form under Section 2 “Your Gift” where you can fill in a “private note” for me personally. Give me your contact information there. If you’re an out-of-towner donor, you’ll need to pay for your own shipping (I’ll get in touch with you about that). Hey, did I mention this is an overnight gig? Yep, it starts at 7 pm Friday night (right after a 10 hr day at work!) and goes on all through the night until 7 am the next (Saturday) morning! (see the logo?) Talk about challenging!! There are “events” throughout the night to keep us motivated (and awake!). If you go to THIS LINK, you’ll see how Relay for Life Baldwinsville participates in the fight. CLICK HERE TO DONATE ON MY PERSONAL RELAY FOR LIFE WEB PAGE. May 28, 2014 ~ Time for an update! Well, the quilt is all done ~ has been for awhile. I should’ve updated this before now! Been getting ready for the Relay for Life part now. I’ll be hauling a bunch of stuff to the school grounds for this overnight campout… tent, sleeping bag(s), chairs, table, some sort of lighting (we will have one electrical outlet) etc. I’m putting together an on-site bake sale at our vendor’s tent that will be set up near the hub of activities – also near the porta-potty (we’ve got our priorities straight!). The event starts at 7 pm and continues on all night until around 4:30-5:00 a.m. There will be bands, entertainment, themed laps around the track, all kinds of other fundraisers in the midst. Sounds like a busy/fun night coming up! I’m tentatively planning to have our Quilt Raffle drawing at midnight (EST) ~ hopefully going to have our Team Captain pull the winning drawing. I hope you’ve enjoyed checking out my Relay for Life Quilt for the quilt raffle. Lotsa work and love right there. I think the best part, so far, is that everyone who has purchased a ticket(s) is someone I really care about ~ whether they’re family, friends, co-workers and/or colleagues. I’d love to see any one of them win this special gift. And I’d love to see more family, friends, co-workers and/or colleagues get in on the raffle! It’s SEW EZ! The links to donate/purchase a raffle ticket are above. Only $5.00 per chance!